It is always good to take a look at long-term trends when short-term volatility increases, in order to have a better sense of the market direction. While the widely anticipated stock market correction remains a possibility, in our view, the long-term bullish trend for U.S. equities is still intact. 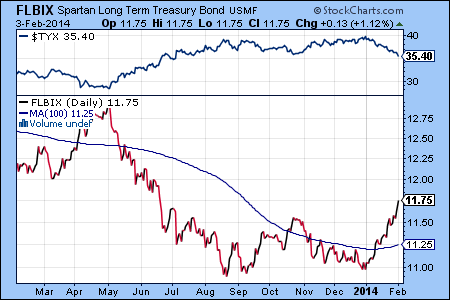 Perhaps, the most interesting new development in 2015 is the renewed interest in buying gold mining stocks. The chart of the Fidelity Select Gold Fund (FSAGX) below shows a short-term bullish double bottom pattern and increased buying activity during the first two weeks of the New Year. However, gold has a long way to go before it can establish a long-term uptrend. While gold is traditionally viewed as an inflation hedge, in the current deflationary environment precious metals are looked at as an alternate asset class that can potentially serve as a volatility hedge. We’d like to caution investors, that while gold can provide returns that have low correlation with equities, this sector is highly speculative and is more appropriate for the purposes of short-term trading than long-term investing. As noted in earlier articles, we believe that it is still too early to diversify into the weakest sectors, such as natural resources (in particular energy), and into underperforming international markets. 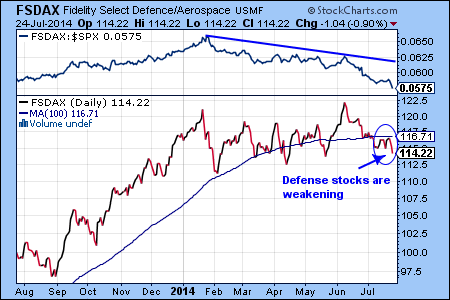 The Fidelity Select Defense/Aerospace Fund (FSDAX) is the weakest performing Fidelity fund with a -2.63% year-to-date return. 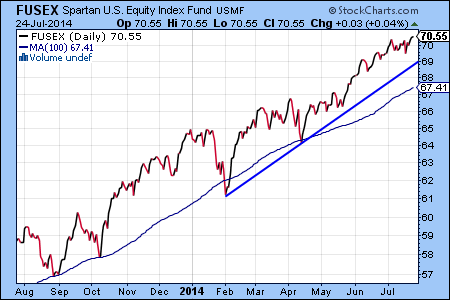 The chart below shows that the relative strength of this sector has been declining since the January correction. The chart pattern is negative, as well. 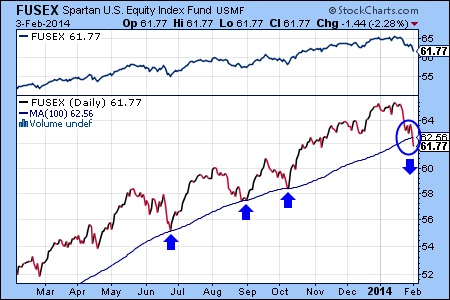 We would avoid investing in this sector until FSDAX regains its momentum and moves above the 100-day moving average line. 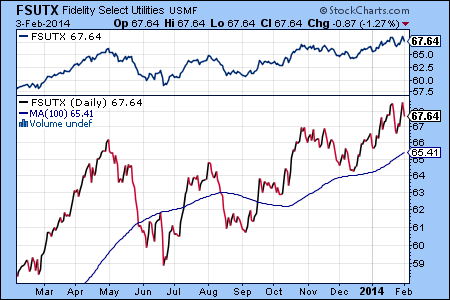 The next chart shows that Fidelity Real Estate Fund (FRESX) is one of the most interesting opportunities to watch for in the next few weeks. 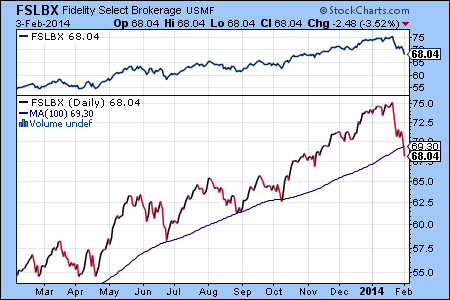 The top part of the chart displays the relative strength, which is the ratio of FRESX versus the S&P 500 index. The blue arrow indicates that the relative strength is improving for this sector starting from the beginning of January. Indeed, FRESX did not correct as much as FUSEX in the recent sell off and has already broken out to a new high for the year. The 1-year chart also shows that FRESX has not yet established a clear bullish trend, but the price action is promising. 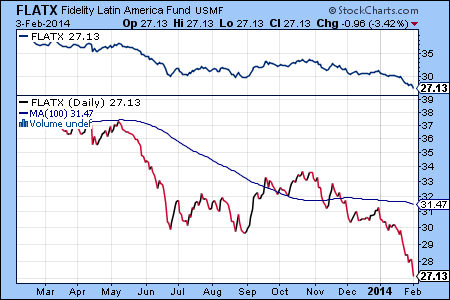 The weakest Fidelity international equity fund was the Latin America Fund (FLATX) with a -3.42% loss. Equity markets in Latin America have experienced a tremendous bear market for more than a year now and are severely oversold. We expect a relief rally to happen in the near future. Both the Dow Industrial and the S&P 500 indexes are in uncharted territory again. 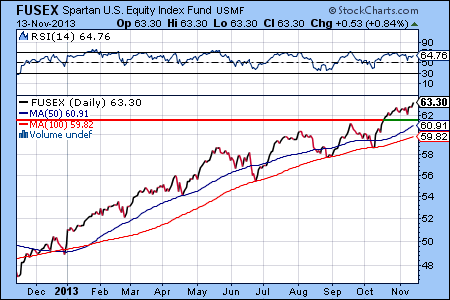 Fidelity’s Spartan U.S. Equity Index Fund (FUSEX) has been one of the best ways to participate in the bull market for stocks in 2013. Receive notifications of new posts. Cancel any time, just click the "Manage Subscription" link in E-mails.